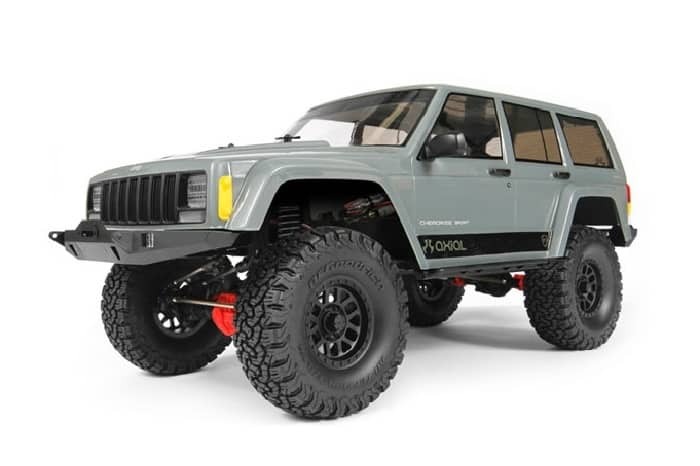 AXIAL SCX10 II JEEP CHEROKEE 4WD ARTR ROCK CRAWLER. The SCX10 has been the vehicle of choice for scale trail fun! For the past 8 years the SCX10 has been the staple vehicle platform for scale trail enthusiasts around the world. 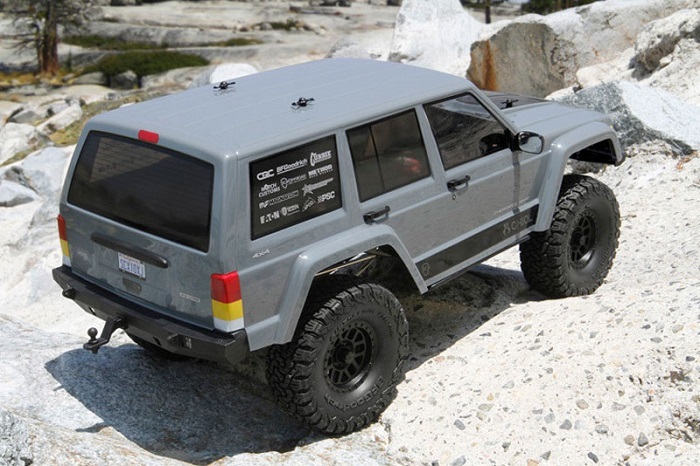 Axial was one of the first companies to embrace R/C rock crawling and the first to mass produce a scale trail truck. Axial has been watching trends, tirelessly testing, and experimenting to create the next evolution of the SCX10. The SCX10 II is the culmination of many years of development, furthering aesthetic realism while maximizing trail performance. 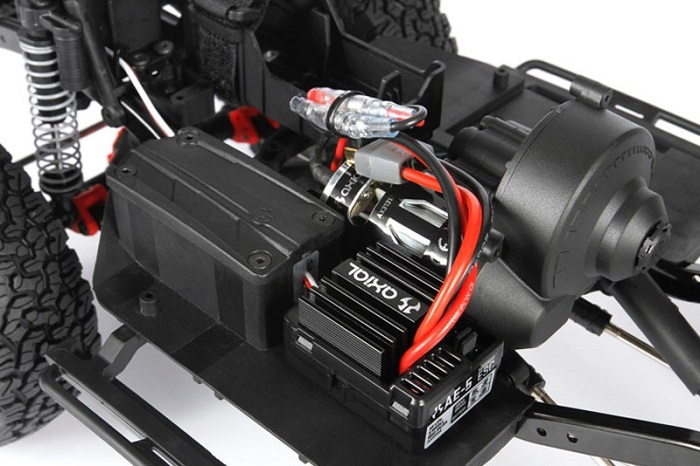 The next generation of SCX10 is here!. While developing the next iteration of axles such as the AR60, we started thinking about what kind of axle would be more suited for the future of the SCX10. Our design of a new axle needed to feature three key points. First, we wanted the axle housing to visually quench the thirst of scale enthusiasts. Second, we needed to create a gear set with the technical attributes to overcome the torque twist that is often associated with smaller gear sets. Third, the axle itself needed to be durable. With the SCX10 II, Axial have kept the essence of the SCX10 there with all-metal twin c-channel frame rails, but thatΆs only 2% of the 98% of a completely new design. Scale AR44 high pinion axles, a chassis mounted servo (CMS), re-designed transmission, front mounted battery tray, all aluminium suspension links, and a properly designed suspension for nearly zero bump steer. 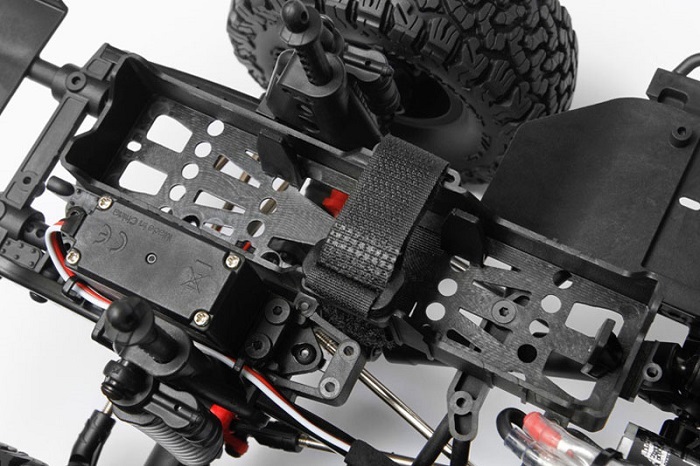 These are just a few of the features built into the all new SCX10 II. 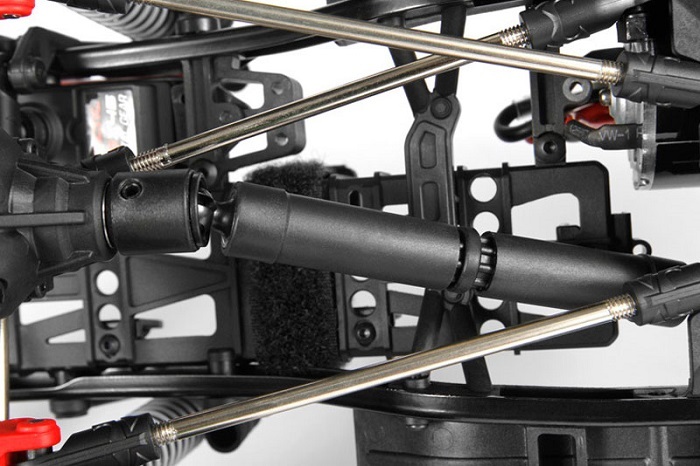 The realistic high strength c-channel chassis frame is made of durable steel with cross bracing for reinforcement and is held together with all hex hardware. Realistic looking frame and cross braces improve chassis rigidity (torsional stiffness). Realistic shock hoops with multiple shock mounting positions allows you to adjust your suspension for maximum performance. The simplified design makes maintenance and assembly quick and easy. The contoured skid plate significantly reduces hang-ups on terrain. 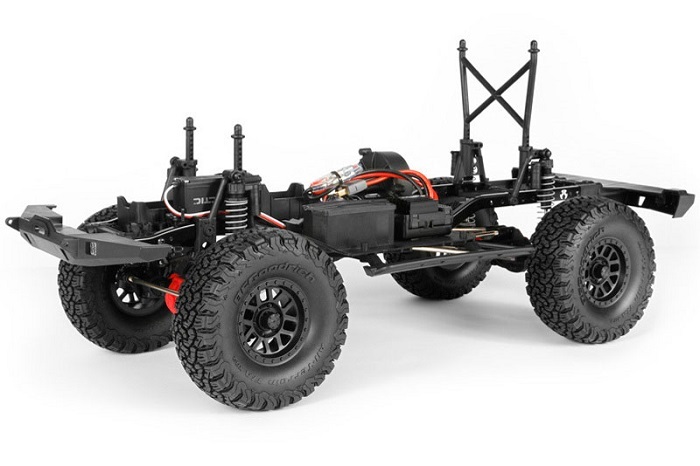 This chassis is designed with a 12.3” wheelbase length, but is easily adjusted to either a 11.4” or 12.0” wheelbase (optional link kits sold separately). 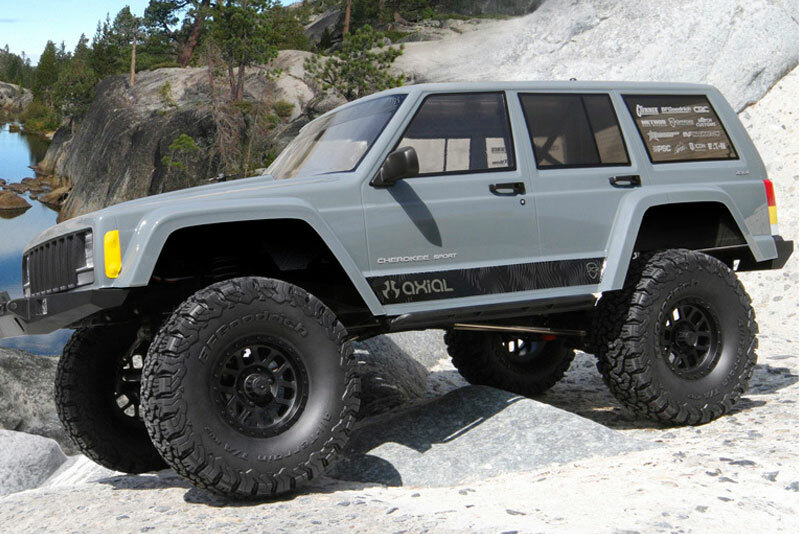 Axial designed the chassis so that all the wheelbase adjustability happens out back without sacrificing front-end suspension geometry. Simple removal and installation of the suspension links and changing the drive shaft length allows an easier way to adjust the wheelbase. The new adjustable battery tray is now relocated lower and further forward for better weight distribution and centre of gravity (COG). The adjustable tray prevents the battery from coming loose or shifting while driving. Posts are included so that you can fine tune the fit based on the battery you choose to run. Batteries up to 32mm x 44mm x 147mm can be accommodated along with easy access for quicker battery changes. In an industry that's all about the latest and greatest, while taking advantage of styling trends, sometimes the 'less is more' approach is quite refreshing and the mesh wheel offers just that. Clean, simple and METHOD STRONG! These officially licensed METHOD Mesh Wheels are replicated in true form for durability and a clean line look. When it comes to tough terrain, adventure seekers reach for BFGoodrich All-Terrain T/A® KO2 tires for their dependability on the roughest backroads and performance even in the most difficult off-road terrain.